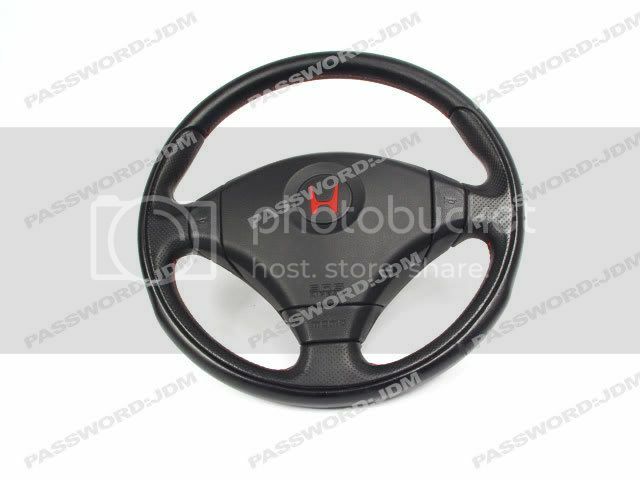 What are my steering wheel options? I want something that is OEM honda, and that i will still have an airbag. other than the obvious s2000 and JDM Type S. what are my other options? ITR, maybe? EP3? pictures and writeups are appreciated. i dono i would really like one with a functional airbag considerin i have been in a bad accident in a friend's car and the airbag saved my head. do you know if the ITR SRS airbag will work in our cars? DC5R wheel fits, because I've seen it done. Bustr was saying something about it being 2 stage airbag, rather than our 1 stage. So whether or not it will actually work I'm not sure. However I think the DC5R wheel would be a safer option in that respect, because the S2K has such a different seating position to the Prelude, the airbag release would be designed around that seating position. This would possibly cause great issue with the different seating position in the Prelude. Not sure, I've asked before on a number of forums, and nobody seems to know. i had thought about that too about the seating position with s2k wheel. because i have sat in a couple of s2k's and it is alot different. is the DC5R and the EP3R the same? because they definately look it. i kinda think the s2k wheel looks too big and gauky in a 5th gen but its def an improvement over our stock wheels. what's the bolt pattern? or if i was going to swap should i get a new hub? if you look in my first post i said other than the S2K wheel. what are you talking about? i am asking what factory honda steering wheels will bolt right up to a 5th gen factory hub with working airbags. i am not talking about aftermarket stuff. so wouldn't that be pretty much any oem honda/acura wheel? or am i missing something here? no because some just wont bolt right up and others the airbag isnt single stage. the catch is the airbag. oh gotcha...so it HAS to be a single stage airbag? Sry. I've heard that u can use an Civic Si EP3 wheel and put a s2k airbag in it. Yeah. it has 2 be single stage 2 work. i have seen those DC5R's they are nice. are they single stage? what about this one its a DC2R wheel, anyone got any info on it?